As we age, many of us lose our eyesight to one degree or another and struggle to keep up with old habits and hobbies. There are solutions available for this issue that can help your clients keep doing handcrafts or crosswords, but reading in particular can be a struggle. Luckily, there are all kinds of opportunities for you to keep your clients reading their favorite detective novels or Civil War nonfiction books. 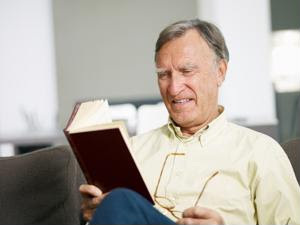 If you provide in home care, see whether your clients have any large-print books lying around and make sure the print is large enough for them to read comfortably. If so, offer to stop by the library and get some of the latest releases for them to peruse. There are even book clubs for large-print material that will send you books of your clients' choice each month, if you and your clients are interested in such a service. Audiobooks are no longer the big clunky tapes you and your clients might think of. Instead, they're easy to listen to on your computer or even your phone. There are plenty of places to download them - from services that have the latest bestsellers for sale to websites that have volunteers read public-domain books you can access for free. If it's difficult for your clients to navigate the Internet, it could be a nice gesture for you to find and download audiobooks for them and write simple instructions on how to listen.